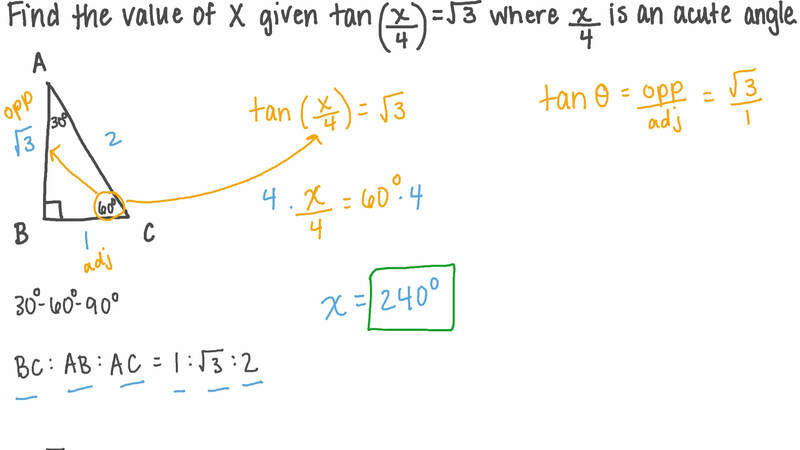 In this lesson, we will learn how to solve simple trigonometric equations. What is the general solution of s i n 𝜃 = √ 2 2 ? Find the value of 𝑋 given t a n  𝑋 4  = √ 3 where 𝑋 4 is an acute angle. Find the solution set of t a n t a n t a n t a n 𝑥 + 7 + 𝑥 7 = 1 ∘ ∘ , where 0 < 𝑥 < 3 6 0 ∘ ∘ . Find the solution set of s i n c o s c o s s i n 𝑥 1 6 − 𝑥 1 6 = √ 2 2 ∘ ∘ , where 0 < 𝑥 < 3 6 0 ∘ ∘ . Find the solution set of 𝑥 given t a n t a n t a n t a n 𝑥 − 6 4 1 + 𝑥 6 4 = 1 ∘ ∘ where 0 < 𝑥 < 3 6 0 ∘ ∘ . Suppose 𝑃 is a point on a unit circle corresponding to the angle of 4 𝜋 3 . Is there another point on the unit circle representing an angle in the interval [ 0 , 2 𝜋 [ that has the same tangent value? If yes, give the angle. Consider , a point on a unit circle corresponding to the angle of . 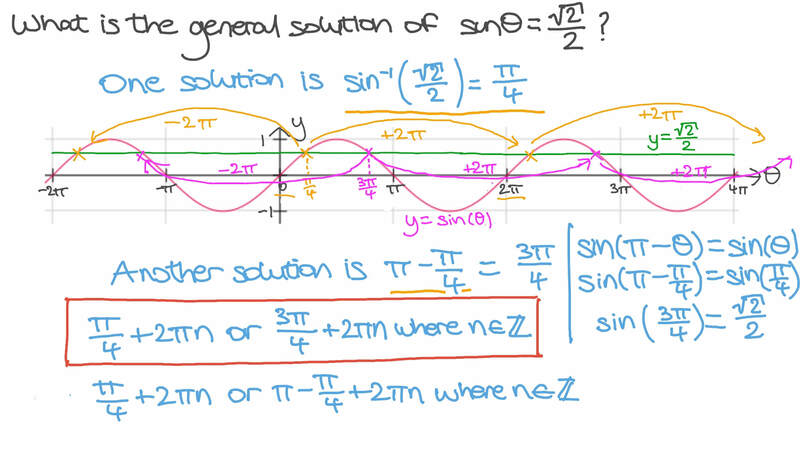 Is there another point on the unit circle that has the same -coordinate as and represents an angle in the interval ? If yes, give the angle. Find the set of values satisfying 4 𝜃 − 1 = 0 s i n 2 where 9 0 ≤ 𝜃 ≤ 3 6 0 ∘ ∘ . Find the general solution to the equation c o t  𝜋 2 − 𝜃  = − 1 √ 3 . Suppose is a point on a unit circle corresponding to the angle of . Is there another point on the unit circle that represents an angle in the interval and has the same -coordinate as ? If yes, give the angle. Find the set of values satisfying c o s ( 𝜃 − 1 0 5 ) = − 1 2 where 0 < 𝜃 < 3 6 0 ∘ ∘ . Find 𝜃 in degrees given c o s ( 9 0 + 𝜃 ) = − 1 2 ∘ where 𝜃 is the smallest positive angle. Find the set of values satisfying √ 2 𝜃 𝜃 − 𝜃 = 0 s i n c o s c o s where 0 ≤ 𝜃 < 3 6 0 ∘ ∘ . Find the solution set for 𝑥 given c o s c o s s i n s i n 𝑥 2 𝑥 − 𝑥 2 𝑥 = 1 2 where 0 < 𝑥 < 3 6 0 ∘ ∘ . Find the solution set for 𝑥 given s i n c o s c o s s i n 𝑥 3 5 + 𝑥 3 5 = √ 2 2 ∘ ∘ where 0 < 𝑥 < 3 6 0 ∘ ∘ . 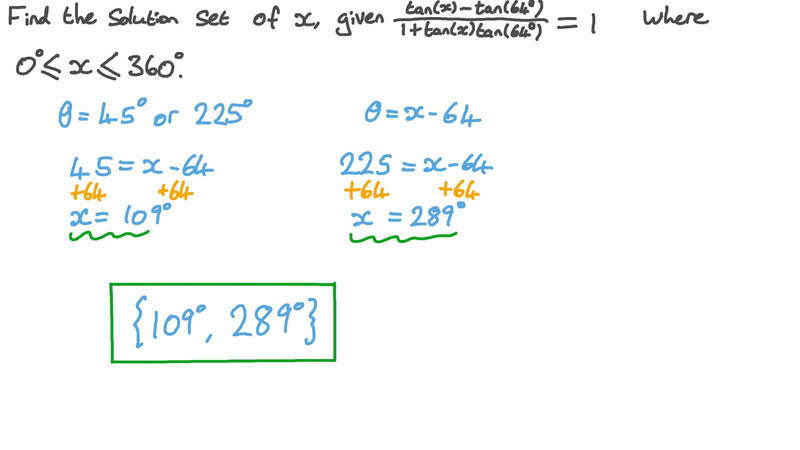 Find the solution set of 𝜃 given t a n t a n t a n t a n 2 5 𝜃 − 2 3 𝜃 1 + 2 5 𝜃 2 3 𝜃 = √ 3 where 0 < 𝜃 < 9 0 ∘ ∘ . Find the solution set of the equation s i n s i n s i n s i n ( 6 7 + 2 𝜃 ) ( 7 9 + 𝜃 ) + ( 2 3 − 2 𝜃 ) ( 1 1 − 𝜃 ) = 1 ∘ ∘ ∘ ∘ given 0 < 𝜃 < 𝜋 2 . Find the set of possible values of 𝑥 which satisfy 1 √ 𝑥 − 𝑥 = 2 c o s c o s 2 4 where 0 < 𝑥 < 3 6 0 ∘ ∘ . Find 𝑚 ∠ 𝜃 given c o s s i n s i n c o s 3 4 . 5 3 4 . 5 + 1 2 6 9 = 𝜃 ∘ ∘ ∘ where 𝜃 is a positive acute angle. Find the set of solutions in the range 0 < 𝑥 < 1 8 0 for the equation ( 𝑥 + 𝑥 ) = 2 2 𝑥 s i n c o s s i n 2 2 . Find the solution set of given , where . What is the general solution of c o s 𝜃 = √ 3 2 ? A 𝜋 6 + 2 𝑛 𝜋 or − 𝜋 6 + 2 𝑛 𝜋 where 𝑛 is an integer. B 𝜋 2 + 2 𝑛 𝜋 or − 𝜋 2 + 2 𝑛 𝜋 where 𝑛 is an integer. C 𝜋 3 + 2 𝑛 𝜋 or − 𝜋 3 + 2 𝑛 𝜋 where 𝑛 is an integer. D 𝜋 4 + 2 𝑛 𝜋 or − 𝜋 4 + 2 𝑛 𝜋 where 𝑛 is an integer. Find the set of values satisfying 1 1 𝜃 + 1 3 = 0 t a n where 0 ≤ 𝜃 < 3 6 0 ∘ ∘ . Give the answers to the nearest second. Find all the possible general solutions of c o s s i n c o s 𝜃 𝜃 = √ 2 2 𝜃 . Find the set of values satisfying c o s 2 𝑥 = − √ 3 2 , where 0 ≤ 𝑥 < 2 𝜋 .